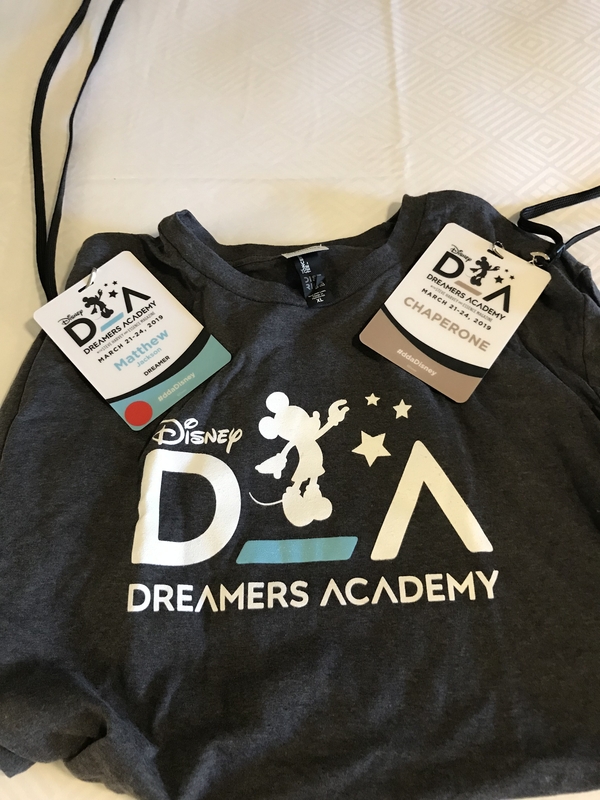 I have written an article detailing what Disney Dreamers Academy is and how your Dreamer can apply which you can read about here. Now I want to let you know what actually goes on during those four days at Disney Dreamers Academy in Walt Disney World. 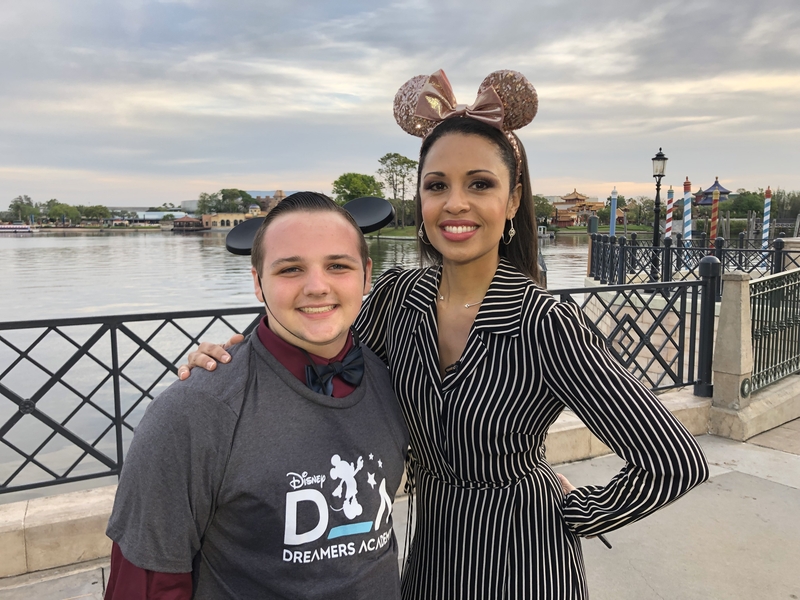 As soon as my Dreamer found out he had been accepted, he excitedly scoured the internet in an attempt to find out what, exactly, he could expect to experience at Disney Dreamers Academy. 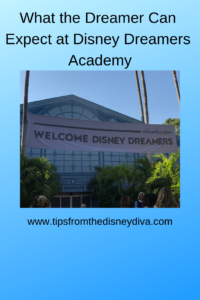 He actually did find a few YouTube videos from previous Disney Dreamers and found out a little from that, so if you have a teen accepted into the Academy, I would encourage them to search for those videos, they will give a little insight to the weekend. On top of those videos, though, I would love to add some more current insight into what my 2019 Disney Dreamer experienced. When you are first contacted about being accepted, it will be in a packet inside an envelope, ours was sent via UPS. There are papers to be filled out, contracts to be signed and you will need to sign it in front of a Notary Public before sending it back. READ YOUR FINE PRINT as soon as you get the packet. Everyone’s first inclination, including ours, was to shout the acceptance to the world. That’s a HUGE no no. There is a no social media clause in the contract. You are not allowed to brag on your Dreamer and they are not allowed to announce the news themselves, until Disney themselves announce it publicly. For us, that was about a month of tortuous silence on the subject. 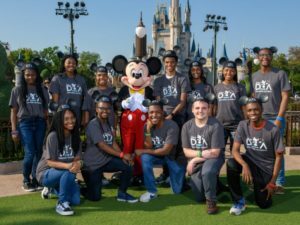 We received the notification around December 15, 2018, and it was publicly announced on Disney Parks Blog that a list of winners had been published on Disney Dreamers Academy website on January 14, 2019. Once this is announced and published, you are then free to shout it out from the rooftops, or on Facebook, Instagram or whatever your favorite social media site is. 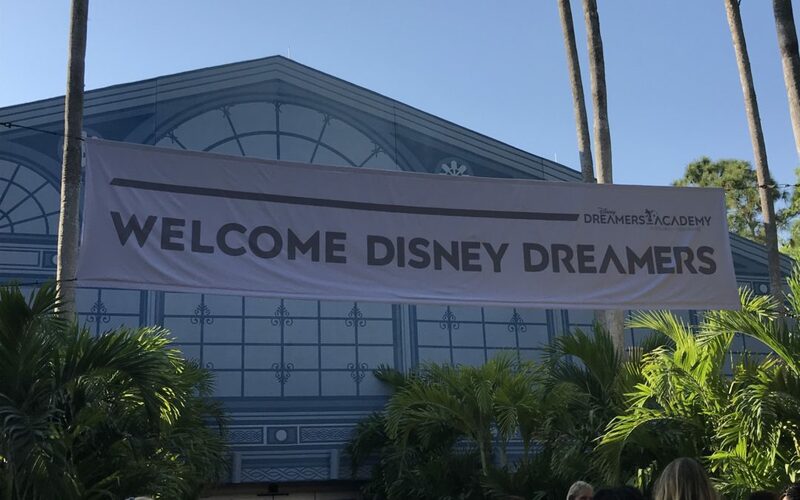 After forms have been returned and info has been verified by Disney, your Dreamer will get an email letting you know it has been verified as well as letting you know what Disney Resort the Dreamers will stay at. It changes from year to year. We got to stay at Coronado Springs, which I loved. It helped me check another Resort off of my bucket list. Email correspondence about the Academy was wonderful. We were emailed when flights were booked, along with all of the flight details, they emailed with everything we needed to know. 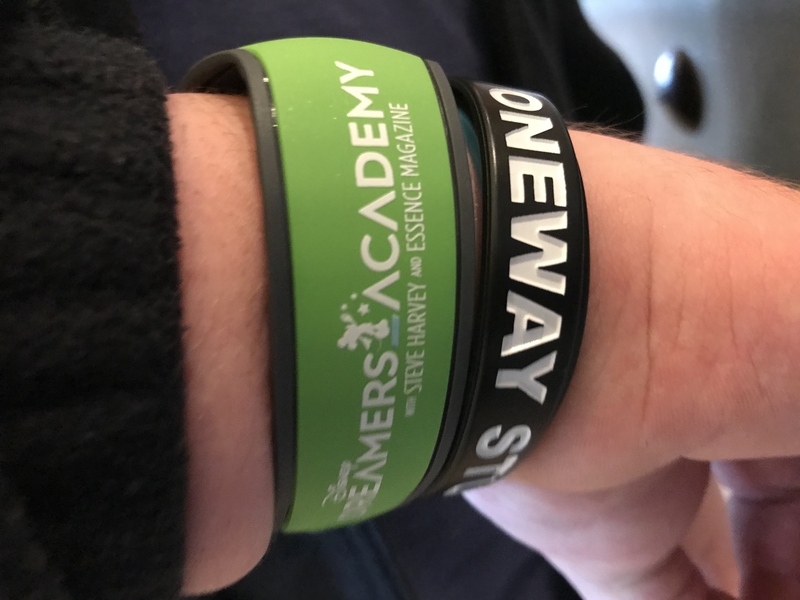 The day your Dreamer arrives, once they arrive at the resort, they (and their one chaperone) will check in and get their magic bands. Once checked in, if you didn’t already notice them, you will see the student’s Dreamer Representative’s waiting with signs, one of these signs will have your Dreamers name. 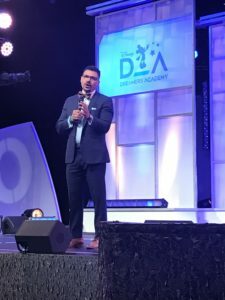 The Dreamer rep is there to take care of your Dreamer throughout the four days. The Dreamer and chaperone will actually not get to see each other much until the last day, graduation day. There will also be an information desk the Dreamer and chaperone need to stop by to get their itineraries and dining gift cards so they can pay for meals. Where the chaperone’s itinerary is only one page, the Dreamers itinerary is two and a half pages. There will be a LOT crammed into these four days. Please note, the Dreamer only needed to pay for one meal during the four days there, as most are eaten at the Academy. The Dreamer and chaperone will then go by the hospitality rooms (don’t worry, they will tell you where that is when they give you the itineraries) and pick up some goodies. This year, our Dreamers got a great quality backpack to carry during the weekend, a filtered water bottle, notebook, pen, cell phone battery charger (you KNOW these teens need that! 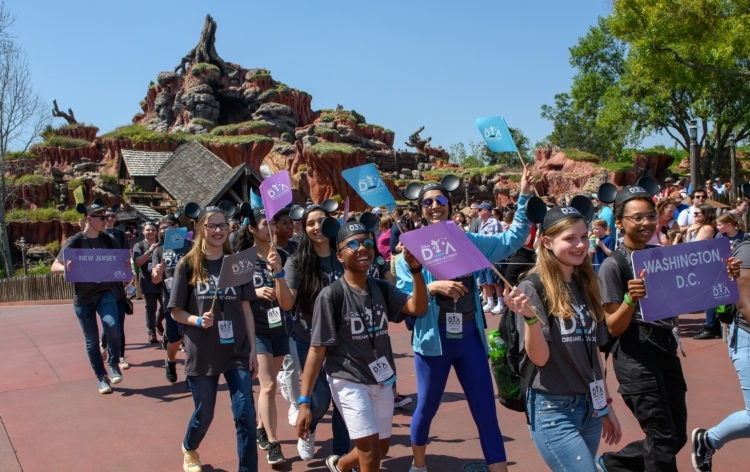 ), their own personal business cards (they will need these later), a lanyard which will need to be worn at all times and three Disney Dreamers Academy tee shirts, one to wear each day except graduation day. You will need to bring nice, dressy clothing for graduation day, so no tee-shirt is needed. If you have time, grab a quick lunch using the provided dining cards before meeting in the spot the Dreamer Rep told you to meet at. From there, the Dreamers and chaperones are bussed on private buses to Magic Kingdom where the Dreamers get to walk in the pre-parade that day. 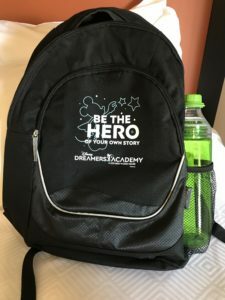 There will be time for a few quick rides before everyone has to meet again and jump on the buses to head over to Epcot where the Disney Dreamers Academy will actually take place, in a building tucked away behind World Showcase. The first day there will be the Dreamers Welcome Ceremony. 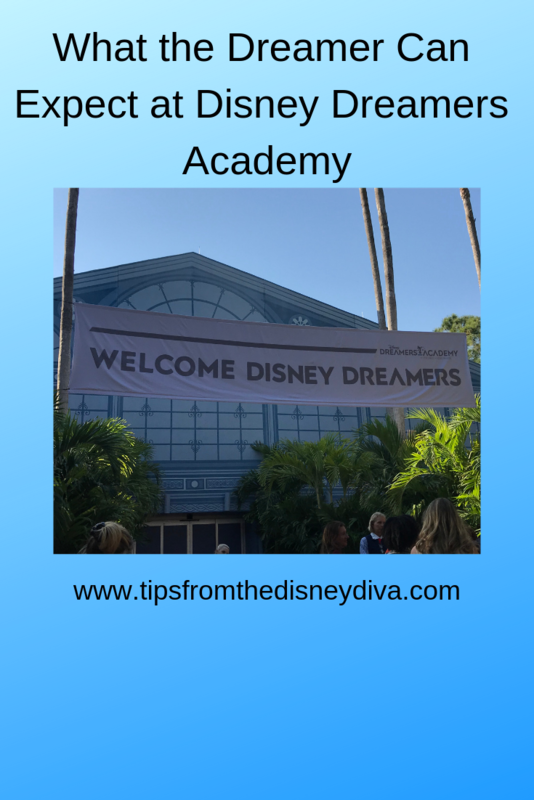 This is where you will get to hear from a few key speakers who welcome the Dreamers to the Academy. All of the Dreamers will sit together, so the separation from the chaperone’s has begun. This is a great opportunity for your Dreamers to connect with others their age who have dreams and goals. 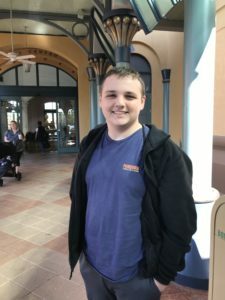 After the ceremony, for the 2019 Academy, we were all bussed over to Disney Springs where we were able to attend a movie screening of Dumbo before it was actually released to the public. By the time everyone got back to the resort, it was close to midnight. Take note Dreamer: YOU WILL NOT GET MUCH SLEEP DURING THIS FOUR DAYS! It’s totally worth it though. Day two for the Dreamer means getting up and on the bus by 7:20am to head for the Be 100 Breakfast and Dreamer Programming. This is where they get to hear from the one and only Steve Harvey, as well as other amazing speakers. This ends around noon, and as the chaperone’s arrive for their session, Dreamers will grab a boxed lunch and head out for their Deep Dives. This was one of the most exciting parts for my Dreamer, he got to head to the ROY studio and work on technical production for a video he made with other Dreamers. The Dreamers Deep Dives all depend on the career choice they had previously let Disney know about. Some got to work with Disney Chef’s as well as celebrity Chef Jeff. Some got to sing in a recording studio. 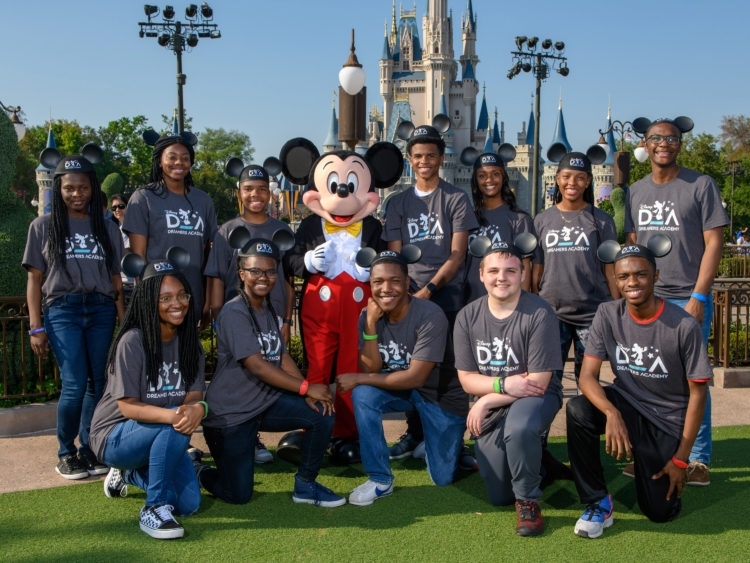 Some got to work with business entrepreneurs, some got to work with Disney Veterinarians and animals, some got to work with Disney Imagineers on engineering. Deep Dives are seriously great opportunities for the Dreamers. 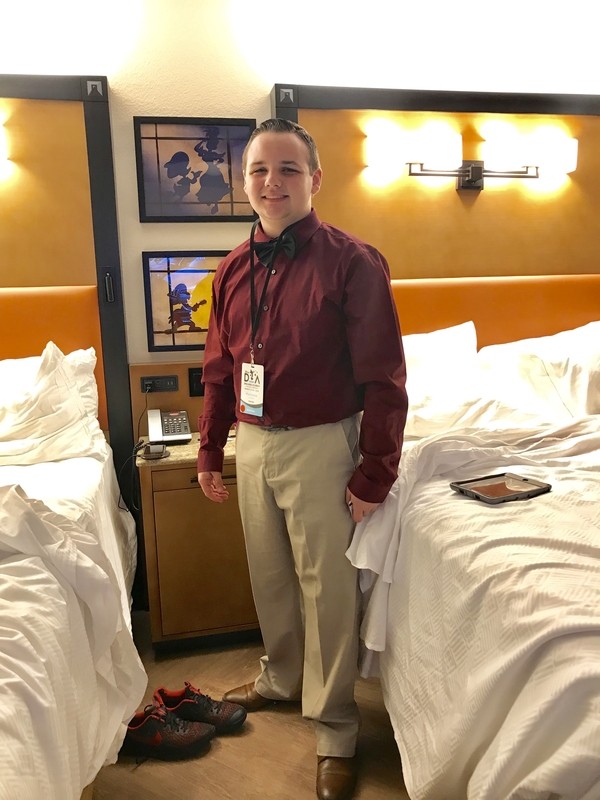 After Deep Dives, the Dreamers head back to Epcot for the Chef Jeff Family Style Dinner where they can enjoy a meal and hear from more incredible speakers. After the dinner, the males are sent to the GM Test Track Lounge for a male empowerment session and the females remain at the Academy for a female empowerment session. 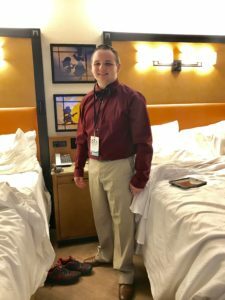 As the parent/chaperone, I can’t speak as to what exactly was said during these sessions, I do know my male Dreamer really enjoyed his session and I’ve heard nothing but positive reviews from the other males as well as females. After the empowerment sessions, the Dreamers headed back to the resorts to get a few hours of sleep. Day three for the Dreamer starts even earlier, meaning they had to be on the bus by 6:30am. I told you there wouldn’t be much sleep. For our Dreamers, they got to experience a quick ride on Soarin’ before the park opened and then headed to breakfast and their morning programming. 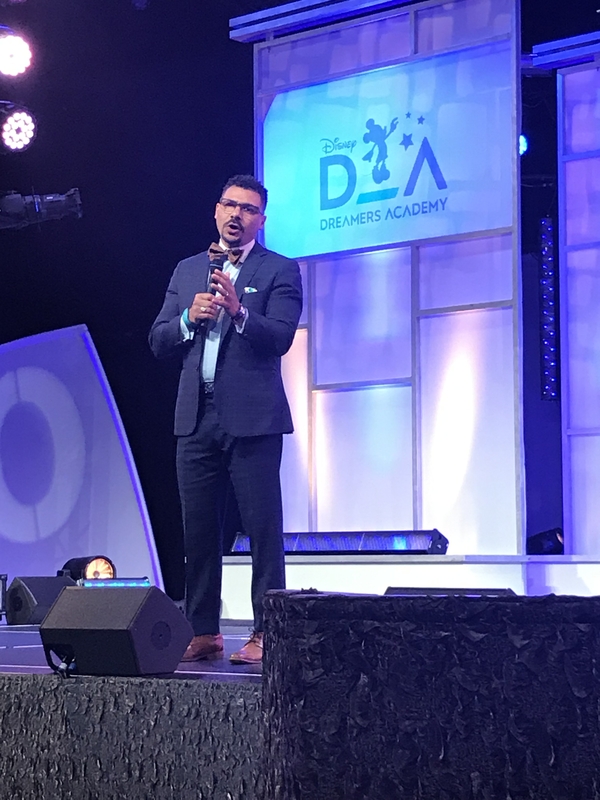 After this, the chaperone’s got to join the Dreamers for a wonderful session featuring Dr. Steve Perry, who brought some incredible insight from an educator’s point of view. PLEASE NOTE: THE DREAMERS AND CHAPERONE’S WILL NOT BE SEATED TOGETHER DURING THIS TIME. After this, there will be a few minutes set aside for select Dreamers to be interview by various press. Yes, the press is all over this event. My Dreamer was interviewed by someone at this time, but neglected to even find out who, so this mama never got to see or hear or read it. After this, the Dreamers grabbed a boxed lunch, loaded on the bus and got to enjoy a few hours at Hollywood Studios while hitting some rides. From there, they went back to Epcot for a couple of more sessions as well as Career Open Mouse. This is where they get to mingle with executives a people in the fields they may be interested in, hand out some business cards and ask for some business cards and basically try to connect with people who could possibly help them or even employ them in their chosen career in the future. After this, they got to enjoy some down time with a dance party and some desserts before coming back to the resort. Day four is graduation day. The Dreamer and chaperone need to put on their spiffiest duds and load on the buses, this time, the Dreamer and chaperone get to stay together. Well, together unless your Dreamer is like mine. 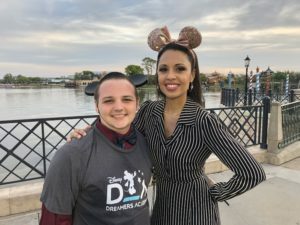 I got a text the night before that my Dreamer along with about 14 others were chosen to be on Good Morning America early that morning as they filmed live from Epcot. Yikes, my Dreamer was on national television! Before departing though, you need to clear everything out of your rooms, check out and drop your luggage at the designated spot that you were previously told. For us, as we approached the building, there was a group outside to welcome us playing African drums and building some excitement. Make sure when you enter you and your Dreamer sit together. The breakfast is served and the ceremony begins, you will get to hear from a few of the speakers that have been with your Dreamer the last four days. 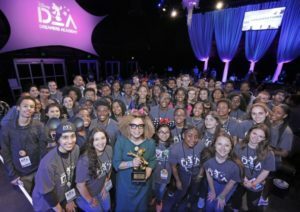 Steve Harvey will make an appearance again, George Kalogridis, the president of Walt Disney World, will be there, and awards will be given out for a few of the Dreamers. 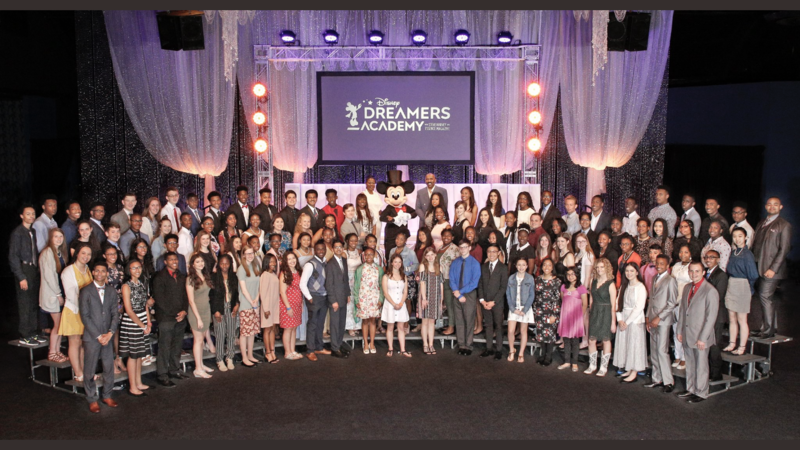 The Courage Award, the Leadership Award and the Dreamer of the Year award were given, and some were even awarded with amazing internships with big names like Essence Magazine, Chef Jeff and a trip to work with recording artist Ne-Yo in Los Angeles. After this, the chaperone’s are given the graduation rings to present to their Dreamers in the final moments of commencement, followed by a private performance from Animal Kingdom’s Festival of the Lion King. Tears will fall! 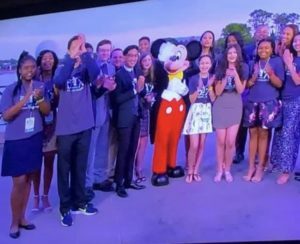 After this, the Dreamers are sent out for a class photo with Mickey Mouse and Steve Harvey while, for the 2019 class, the parent chaperone’s got to enjoy one last parent panel with some of the speakers. – Though I’ve mentioned that you will sit and listen to speakers, please don’t be mistaken and think you will be bored. These speakers are some of the most inspiring, motivating, intelligent, hilarious and caring speakers I’ve ever heard. You will be hanging on the edge of your seat as you listen to them, trust me! – You will form lifetime bonds with others your age. 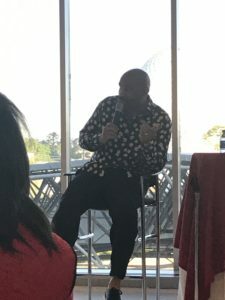 You will finally be in a room full of teens who have a deep passion for something, and even if it’s not the same thing you are passionate about, you are still connected. Meeting other teens who already know who they are and what they want to do is rare, so you have that connection. – You will be more inspired and empowered to boldly go into life and be the best person you can be than you have ever been before. – You will NEVER forget the feelings you experienced during your four days. – You will realize that even if you have to return to the real world, this is your moment to put into action everything you have learned from this event. – You will be exhausted when it is all over. – You will probably have to hear some negativity from your peers who are jealous of all you experienced, it’s up to you to rise above it and be 100. So this is the four days at Disney Dreamers Academy in a nutshell. The speakers may or may not change from year to year. The itinerary will probably alter somewhat each year as well. The feelings and emotions you experience will not change. 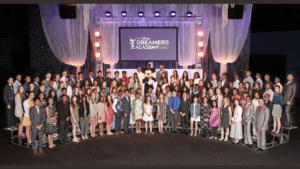 Remember, you are one of just 100 teens in the entire nation who was chosen to participate, this is your destiny moment. 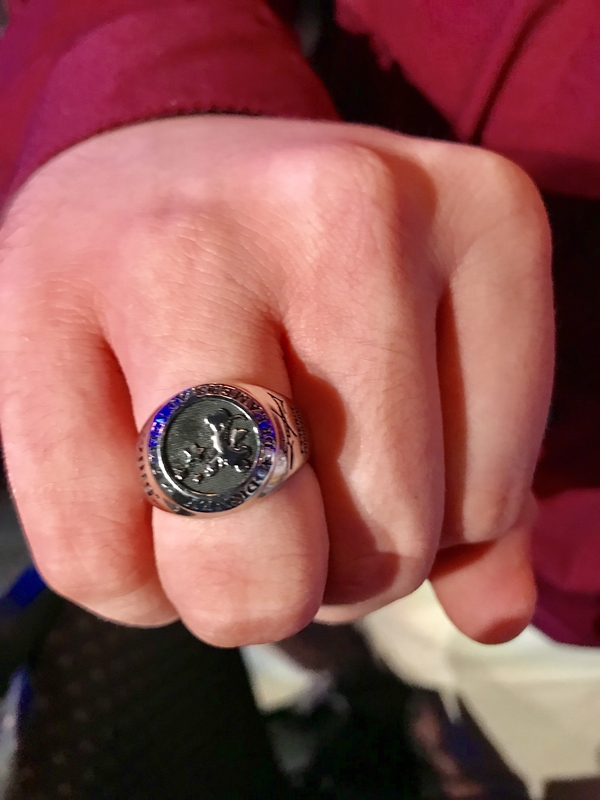 Hold on to it and try to savor the experience while you are in it.